Our Biochar programme, headed up by our resident horticulturalist Laura, who trained at RHS Wisley, is adding another sustainably sourced product to our range, and we are all quite excited about it. ‘Funny odd bits of wood from the Herefordshire woodlands we manage that we can’t use for our premium products are the perfect ingredient for making Biochar’. Meanwhile Jane is still recovering from blisters and an aching back after spending 4 weekends on her knees, hand forking 100 litres of donkey poo charged biochar into her garden. ‘I love my garden but I haven’t had the time to look after the soil for the last few years, and it had got compacted and mossy, but after a lot of hard work the improvement is really noticeable. I’ve taken some pictures during the process, (see base of page) and will take more at the same time next year to chart progress’. ♥ Biochar is charred biomass that is intended for use in soil and growing medium. ♥ We’d love to have come up with this idea, but it’s not new. Every time lightning hits and plant material is charred it eventually gets incorporated into the soil. It’s totally natural! 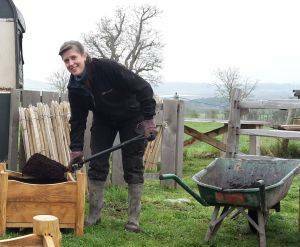 ♥ Our Biochar is Herefordshire wood converted into a solid carbon residue by heating wood in the absence of oxygen. ♥ The remaining carbon matrix has a massive surface area. If 100g was expanded it would cover anywhere between the size of a tennis court and a football field. This is due to the many water and nutrient carrying vessels in the biomass. 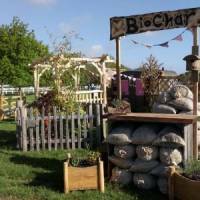 ♥ Biochar is a tool used to bring out the best characteristics of a soil. ♥ More efficient water and nutrient use. ♥ The huge surface area of the char provides beneficial microbes and mycelium with homes. Isn’t that hospitable now? ♥ Carbon from the atmosphere is trapped (sequestered) in Biochar. ♥ Char is not biologically degradable so it will persist in the soil for many years supporting its infrastructure. ♥ During the composting process Nitrogen volatises as ammonia. The char absorbs this Nitrogen and keeps it in the compost. ♥ Speeds of composting in heaps can be increased by adding Biochar. This will also charge your char with nutrients ready for use in the garden. ♥ Use it like chipped bark as a decorative mulch on flower pots or beds. Black makes an excellent blackdrop. ♥ Charge your own: Add a handful to your compost bin in every layer. ♥ Soak in comfrey tea or sea weed extract and leave to mature for at least 2 weeks. ♥ Mix with manure at a rate of 2 Biochar : 1 manure, and mature for at least 2 weeks. ♥ Mix with grass clippings at 50:50, wet down, cover with cardboard and leave for at least 2-3 months. Or mix with compost for more instant results in a couple of weeks. ♥ Keep chickens? For 12 chickens throw in a 5 gallon bucket of char or chicken poo to their run. On the yearly clean out you’ll have deodorised poo charged char. ♥ Ready mixed 2/3 biochar with 1/3 aged five year old donkey poo for your delectation. ♥ Mix with compost for use in planters at 5-10%. This looks like 1 shovel of charged char to 10 of compost. ♥ Add to planting holes. ♥ Lay along seed drills. ♥ Add to your veg patch and flower bed soil at a rate of 5-10%. This looks like ¼ – ½ inch spread over the soil and incorporated 5 inches deep. Pickets, paling and stakes are all (basically) pointed sticks we use in fencing. Say It With Wood shared a post. www.facebook.com/318906164901516/posts/2082189605239821/Herefordshire Wildlife Trust volunteers spent a soggy day yesterday putting up some beautiful chestnut paling at Queenswood with the help of Say It With Wood. The cleft chestnut fencing will protect the newly planted red oak trees in the designated First World War Commemorative Woodland from deer. Say it with wood has exciting news. After a long search we've found a lovely new home for the business. Our core aim has always been to make it easy to access beautiful handmade timber products, with a direct link to managing British woodlands. This old grain store, (less than a mile from our current yard) will be converted to achieve those aims.